Soon appearing on the souvenir tables at Video Games Live events around the world, EMI has announced the first CD release for the video game music event, Video Games Live: Volume One. No longer will fans be forced to choose between a crappy t-shirt or an overpriced program guide (*eyes program guide on the shelf with spite*)! The full CD should be appearing on iTunes soon (perhaps today), with the full CD release and bonus tracks spaced out to coincide with concert events in San Diego later this month and Leipzig in August. So what's on the tracklist? Eleven games are represented, from the whimsical Tetris Piano Opus, to the moving Medal of Honor suite. Myst, Warcraft, God of War, Kingdom Hearts...hell, they've even got Advent Rising on there, which goes to show that your game doesn't have to be successful to make it on the Video Games Live CD...it just has to have music composed by Tommy Tallarico. The track that really makes the disc for me? Wendy Carlos' Tron Montage. Makes me feel like I am 10 years old wearing a cardboard Tron helmet all over again. Hit the jump for the full track listing and sketchy details about availability! LONDON, UK - JULY 7, 2008 - In an exciting collaboration with Video Games Live, EMI Classics will release a CD celebrating some of the best known, most popular video game music of all time. The first worldwide campaign of its kind by EMI is linked to the Video Games Live events planned in North and South America, Europe and Asia over the coming months and aims to appeal to a broad audience of gamers, non-gamers and music lovers of all kinds. 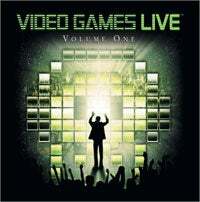 Video Games Live: Volume One showcases some of the more popular segments that currently appear in Video Games Live. The album contains several unique arrangements that were created along with the original composers exclusively for the show, and have never previously been released. Video games are arguably today's most popular entertainment of choice for the 21st century, and the music is central to their attraction. The EMI Classics CD, compiled by Video Games Live co-creators Tommy Tallarico and Jack Wall, who also conducts the recording, features the Slovak National Orchestra, The Crouch End Festival Chorus and The Video Game Pianist, Martin Leung in medleys from hit game franchises such as Halo, Warcraft, Kingdom Hearts, Tetris, Castlevania, Myst and Tron. Video Games Live: Volume One will be released in two stages: The digital release will be downloadable in the UK from July 7th, 2008, with the option to pre-order from a week before that on iTunes and other DSP's (Digital Service Providers) with that capability; the release of the CD and iTunes exclusive, including digital bonus tracks, will be staggered to coincide with Video Games Live events, beginning in San Diego, California on July 24th (North America) and Leipzig, Germany on August 20th (Europe and worldwide). The KINGDOM HEARTS® franchise is the result of a collaboration between Disney and Square-Enix. The ground-breaking fantasy action role-playing game received numerous awards and was a dominating presence upon its release in 2002. The single, Hikari (to which the instrumental version "Kingdom" was based) has sold over 1 million copies in Japan. Female songwriter Utada Hikaru's first official album became the best-selling album of all time in Japan with over 10 million copies sold. Currently, three of her albums rank in the Top 10 all-time best-selling albums list in Japan. Over the course of 15 years, Sid Meier's Civilization series has come to define turn-based strategy games. Few games have managed to combine the sheer addictive depth that the Civilization series commands, and fewer have had such universal appeal. With unprecedented critical acclaim from fans and press around the world, Sid Meier's Civilization game is recognized as one of the greatest PC game franchises of all time. Tetris is arguably the most beloved and biggest selling video game in the world. It was originally conceived and designed in 1985 by Alexey Pajitnov while working for the Soviet government in Moscow, Russia. "Music A" in the Nintendo Game Boy® edition of Tetris is one of the most recognizable and popular songs from a video game. It is an instrumental arrangement of a vocal Russian folk tune called "Korobeiniki" which was based on a poem with the same name written in 1861. The first line of the translated lyrics read… ""Oy, the box is full, so full". God of War is a high-energy action-adventure game based on Greek mythology. It was extremely well received by critics and fans alike and was the recipient of many "Game of the Year" awards. It has been called the greatest PlayStation® 2 game of all time by many top gaming magazines and websites. The award-winning score by Gerard Marino was his first credit as a game composer. Disney's 1982 action sci-fi cult classic masterpiece embraced video game aesthetics and has since inspired numerous blockbuster films and video games alike. Harnessing the latest technology available at the time, Tron was the first motion picture to ever use computer graphics and animation. The album was engineered at EMI's famous Abbey Road recording studios in London.